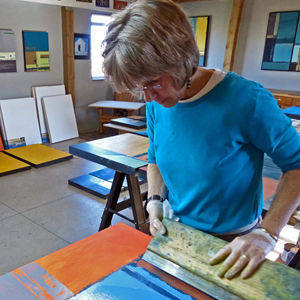 My website: www.CatherineScottStudio.com Following a career as an architect I now spend my time painting in my studio or roaming the high plains of the western United States with my camera. I photograph the old, weather beaten surfaces and patinas of buildings and vehicles. These rich surfaces and compositions provide inspirations for paintings. “Pentimento” is a term often used to define the revealing of painting or part of a painting that has been covered over by later painting. I have always been attracted to the history implied by this term. My painting method echoes this concept, involving constant experimentation as I make marks and cover them, leaving earlier marks revealed below later layers. As I add layers and work towards completion, the paintings eventually develop their own history.